Mickey’s Christmas Carol – This scent will make you want to sit by a crackling fire and cozy up for a night full of tradition. The scent of Mickey’s Christmas Carol is an old fashioned blend of mulled cider and roasting chestnuts. 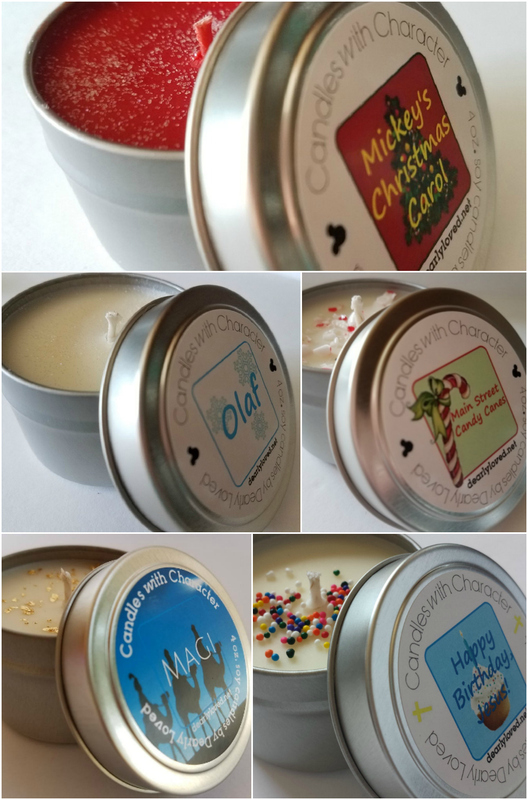 Olaf – This candle will make you feel like you’re in a crisp, winter wonderland with Olaf, himself! The scent of Olaf is a combination of rich chocolate and peppermint. Main Street Candy Canes – Guests line up to watch through plate glass windows as candy canes are pulled and twisted by artisans on Main Street U.S.A. The scent of Main Street Candy Canes is pure peppermint perfection. Magi – With a star to guide them, the Magi brought gifts of gold, Frankincense, and Myrrh in celebration of Christ’s birth. Happy Birthday Jesus – Each year Lyn’s wonderful family buys a cake and sings “Happy Birthday” to Jesus on Christmas day. They really love this tradition. The scent of Happy Birthday Jesus is vanilla birthday cake. YUM! Stay tuned for more festive features from us and be sure check out My Dearly Loved on Etsy for lots of fabulous Disney inspired goodies. You can also find Lyn on Facebook, Instagram and on Twitter.